Sabelli, M. Rasner, J. Pérez Giffoni, C. Álvarez Pedrosian, E. González, L. Ruggia, R. (2014) «Developing Electronic Information Resources to Promote Social Inclusion of Vulnerable Communities in Uruguay». 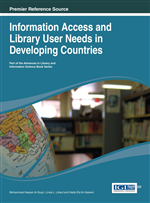 En Information Access and Library User Needs in Developing Countries‏, Al-Suqri, M. Lillard, L. Al-Saleem, N. E. (ed. ), IGI Global, Hershey (Pennsylvania), pp. 140-159.